"...guard what has been entrusted to your care." Sometimes I liken parenting to being in the trenches of a battlefield. Really, let's just be honest here. That's how it feels at times. And it doesn't really matter if your kids are still in your arms, hanging on your pant legs, running laps around you, or tuning you out with their ipods and headphones. Parenting is just plain hard. Last night my best friend sent me a reference and simply said "Put your name in there." I was intrigued. So I went and got my Bible, flipped to I Timothy 6:20 and read "Phoebe, guard what has been entrusted to your care". Guard what has been entrusted to me. Sometimes I don't really think of parenting like that. I just think of things like, "Well crap, it's Friday and I forgot to work on spelling words with Eli all week. I sure hope he knows them. 'ELI!!! Do you know your spelling words?'" And then I have them in the seat beside me as I drive them to school and quiz him all of the 2 minutes it takes to get them there. Or the ritualistic chant that sometimes plays in my head: "Is it bedtime yet? Is it bedtime yet? Is it bedtime yet?" You know how it goes. Someone can't find their shoes. Now a coat is missing. One's out of jeans and the cat is meowing and hissing again because one of the toddlers is pulling his tail. Another is yelling through the house "My field trip money is due today." Someone hit their sibling and someone else is crying because they didn't get their way. And the two year old is constantly calling someone a "booby trap", thinking she's just epically made fun of them. She's so proud of herself. Some days I just stand there shaking my head. There are times I wonder if I have taught them anything at all, other than to say "stupid" and "daggum it". My patience wanes. I find myself wanting to retreat. To run away hide. And suddenly this warrior begins to stand a little taller. Because while these all seem like trivial matters, they're really spiritual battles. Battles of teaching responsibility, patience, kindness, and watching what comes out of our mouths. Sometimes it's guarding them against others. Like saying no to sleepovers and then having to explain to them that it's for their best interest. I mean, I don't know everyone. And I don't know who else they might have over. And I don't know what other kids might be there that have been exposed to some pretty horrible things that they might want to try or experiment with with my kids. And so no. The answer to sleepovers is always no. I'm guarding what's been entrusted to me. And it's hard. So very hard because I know all, well, a lot of, their friends are having sleepovers. But their safety is more important to me than hurting their feelings. They'll understand one day. Now isn't that day and that's okay. Sometimes it's guarding them against an over-crowded schedule. It's saying yes, you can play volleyball, but not volleyball, basketball, and soccer. It's guarding our family time with a vengeance and showing them to value what's really important....what will remain after they're out of school. It's saying yes, your friend can come over today.... but not today, tomorrow, and the next 3 days. It's allowing time for homework and reading. Time to sit down as a family and eat dinner together every night. Time for movie nights and popcorn, family game nights. Because those things are what will matter in the years to come. Is there anything wrong with sports? Absolutely, unequivocally NO. We love to watch our kids play. But the problem happens when it becomes what dictates your schedule and multiply any sport times 4 kiddos and it can happen easily. It's my job to guard what has been entrusted to me. And an overcrowded schedule isn't guarding them well. Sometimes it's guarding what they're allowed to watch. Or how much time they're allowed to have on the Internet, if any. It's standing over them when they do earn Internet time to play games. It's having their Kindles set to only allow them access to age appropriate, educational websites. It's not caring when they get mad because you give them the "you're not allowed anywhere except FRIV.com, do you understand me?" lecture every time they do get to play on the computer. And for those of you with older kiddos, it's blocking the Internet on cell phones or having access to their phone every single day to see what they've been looking at, texting, etc. It only takes one misguided search for an addiction to form. And I'll take them being mad at me any day rather than them having to possibly deal with an addiction. It's saying no to parties and yes to modesty. It's saying no to certain friends and yes to those that have proven themselves responsible and that are following after Christ. It's saying no to TV and yes to family devotions. But here's the one that always gets me. Sometimes I have to guard them against what comes out of my mouth. My impatience. My tone. My snide remarks. The "What were you thinking?" comments. The "Use your brain." or "I can't stand one more minute of the whining." Sometimes it's me. And that's hard. I want to faithfully guard what has been entrusted to me. And often that means constantly working on myself, ensuring that I'm not ever what hinders or causes them to trip up. 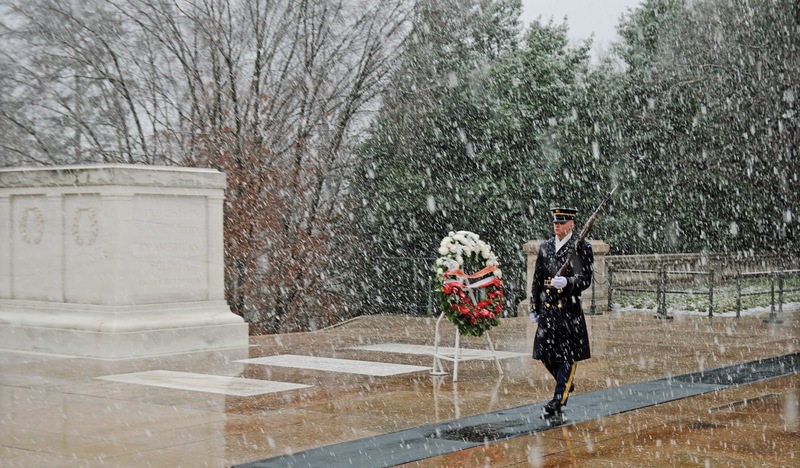 Recently amidst all the snow storms, pictures of the guards at the Tomb of the Unknown Soldier have been surfacing. 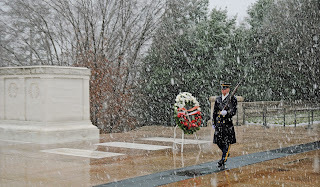 These men are dedicated. 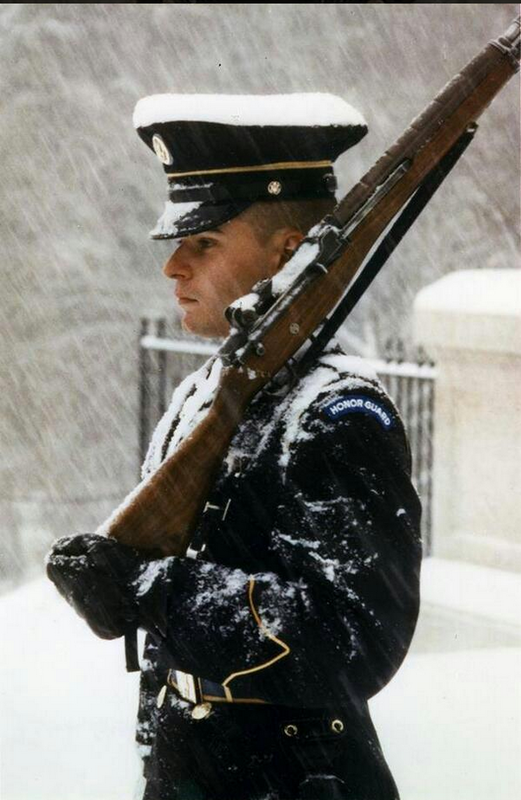 It doesn't matter if there's a hurricane, snowstorm, or if it's 100 degrees, they are there and committed to fulfilling their duties ....they're faithful no matter what's going on around them. I've even seen videos of them commanding respect from those there to watch the changing of the guards that were being less than respectful. Their courage and dedication is inspiring. And oh that I could be like them. That I could stand in the face of whatever life throws my way and guard what has been entrusted to my care. When it's hard. When it's painful. When it's me. When I'm having to take a look at myself. When they're mad. When they're hurt. When they don't understand. When I want to give up. Oh that I could be the guard they need me to be. Because sweet mommas and daddies.... here me in this. We only have them for a short while. I know when they're little that seems like an eternity. Like you'll never have them raised and out of the house only to miss having them there. But I can look back 15 years ago when I got married and it only seems like a few short months ago. And I'm sure you can look back to when you had your babies and think, "No. Really. There's no way almost 10 years have passed." Because He has entrusted to us the most precious, invaluable little people to guard. May we be found standing guard, faithfully and courageously.